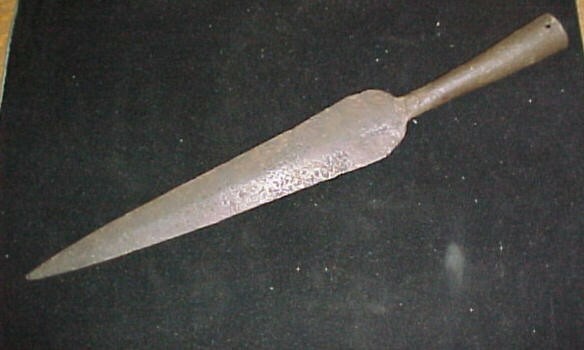 This is a 18th Century Hand forged Spanish Blade-Spearhead traded to the Native Americans who than used it to hunt buffalo in the 19th century. There are three things that the Spaniards brought to the New World. Cattle, Horses, and Iron. All three changed North America but the most important was the horse and iron used to hunt buffalo from horseback. More pictures available. Approx. 13"inches long. Museum Quality. This is a 18th Century Hand forged Spanish Blade-Spearhead traded to the Native Americans who than used it to hunt buffalo in the 19th century. There are three things that the Spaniards brought to the New World. Cattle, Horses, and Iron. All three changed North America but the most important was the horse and iron used to hunt buffalo from horseback. More pictures available. Approx. 13"inches long. Museum Quality. Please email cowboycabin@centurytel.net with questions or call 406 270-2842.